With SYSPRO CyberStore successful organizations can sell more both locally and globally with greater efficiency and ROI. 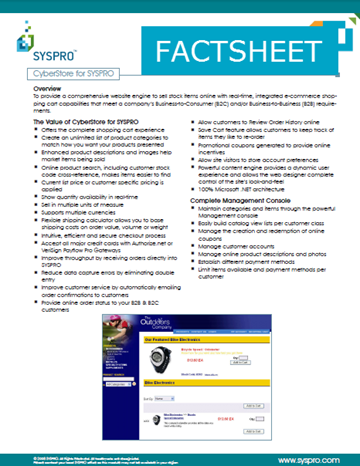 SYSPRO CyberStore enables your company’s sales on the web. Your jaw will drop and your heart will beat fast! CyberStore is for B2B, B2C and hybrid of mixed e-commerce business models. E-Commerce which is a real time robust system which includes payment gateways, shopping carts, credit processing, content management, service and support as well as other enablers. Cyberstore is a comprehensive website engine designed to sell SYSPRO stock items online with real-time, integrated e-commerce shopping cart capabilities that meet a company's Business-to-Consumer (B2C) and/or Business-to-Business (B2B) requirements. If E-Commerce is on your horizon, download the factsheet and take a few minutes to review. We know how to implement systems without a long drawn out implementation process. Get the free factsheet by now by completing the form.